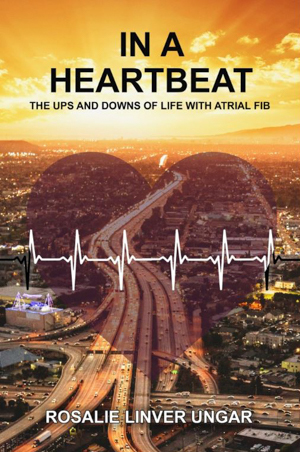 ATRIAL FIB BOOKS:Why Read IN A HEARTBEAT: The Ups & Downs of Life with Atrial Fib? “Author Rosalie Ungar has not only atrial fibrillation, which she refers to throughout her memoir as A-Fib, but a pacemaker. However, as a healthy woman in her late 70s who can do more exercise than ever before in her life, her narrative seems, in fact, to be one of the best resources I have ever seen to answer the myriad questions every person suffering heart issues must have in terms of modern therapies, pacemakers and medical procedures. The reader will learn that people with pacemakers must not have an MRI or be checked with an electric coil wand at airport security. While the author overcame her difficulties, it is very clear during her narrative that she got much worse before she got better. “The A-Fib could wrench her out of sleep and drain her of all her energy. Her medications were becoming less and less effective. Frankly, I was astounded that the author got her life back after the heart ablation. “The pages turn easily in Ungar’s account and the reader will feel admiration. It was fascinating to learn that the rate at which the pacemaker makes the heart beat can be regulated, obviously guided by general health circumstances. Thank you Writer’s Digest Magazine. In last week’s blog, I gave readers a link to an interview I gave to Managing Editor Jodie Elrod for this month’s issue of EP Lab Digest, an international publication for electro physiologists, cardiologists, doctors and hospitals. When you read this article, you will see that my memoir IN A HEARTBEAT is not a medical book. It’s my story told in novel form. Why are so many with A-Fib in denial about getting treatment and seriousness of this problem? Why do more men than women get treatment? Why are some patients afraid to change doctors when not satisfied with current issues of treatment and communication? This entry was posted in Blog on December 24, 2017 by Mark Layman.